I went to a Pampered Chef party a couple of months ago and this was the recipe that we watched the host demo. I was already impressed by how easy they were to make but when I tasted them, I was really sold. 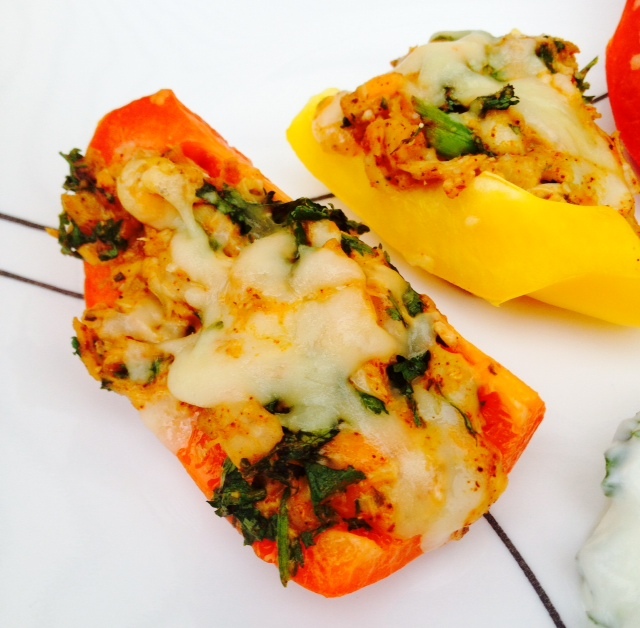 A fresh pepper boat is covered in a spicy, creamy chicken mixture, topped with cheese and broiled. Then you drizzle them with a cilantro cream sauce, although I also think dipping them into guacamole would be fabulous. Everyone went totally crazy over them and they were such a fresh, delicious appetizer. I made them at home soon after, making some adaptations for what I had on hand. 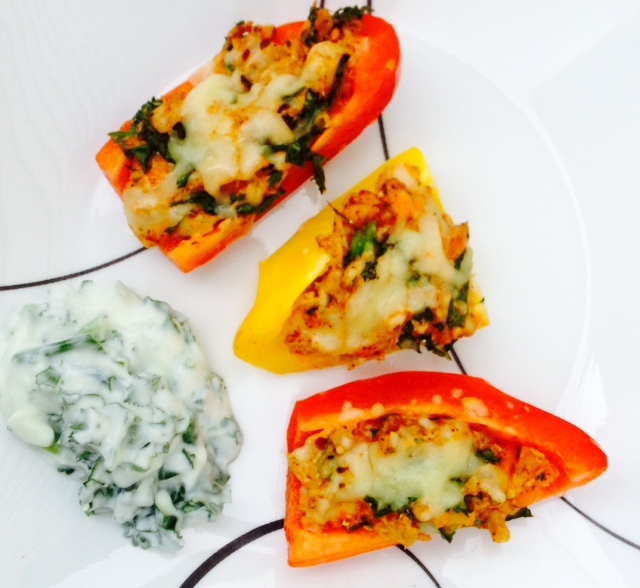 They made for a light, healthy meal and going into summer I think they would be perfect for just about any occasion. Preheat oven to 400 degrees. Line a cookie sheet with foil and set aside. Remove the stem and seeds from each pepper and cut each into 6 wedges. Set on cookie sheet. In a medium bowl, mix half the cheese, half the onions, half the cilantro, taco seasoning, salt, chicken, and mayonnaise together. Divide mixture evenly among pepper wedges. Sprinkle with remaining cheese. Bake 5-10 minutes or until cheese is melted. While peppers are baking, stir together sour cream and remaining cilantro and onion. Use as a dipping sauce or drizzle over peppers.